The classic, traditional, wood-handled stamp. 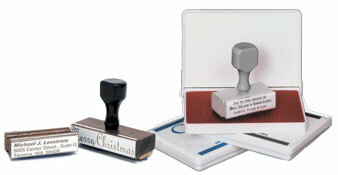 Deep mold, rocker and base lock stamps also available. Please contact us for special orders. Traditional rubber stamp. Up to 2 lines of text. Impression area: 1/4" x 1"
Traditional rubber stamp. Up to 2 lines of text. Impression area: 1/4" x 1-1/2"
Traditional rubber stamp. Up to 2 lines of text. Impression area: 1/4" x 2"
Traditional rubber stamp. Up to 2 lines of text. Impression area: 1/4" x 3-1/4"
Traditional rubber stamp. Up to 2 lines of text. Impression area: 1/4" x 4"
Traditional rubber stamp. Up to 3 lines of text. Impression area: 1/2" x 1"
Traditional rubber stamp. Up to 3 lines of text. Impression area: 1/2" x 1/2"
Traditional rubber stamp. Up to 3 lines of text. Impression area: 1/2" x 2"
Traditional rubber stamp. Up to 3 lines of text. Impression area: 1/2" x 2-1/2"
Traditional rubber stamp. Up to 3 lines of text. Impression area: 1/2" x 3-1/2"
Traditional rubber stamp. Up to 3 lines of text. Impression area: 1/2" x 4"
Traditional rubber stamp. Up to 5 lines of text. Impression area: 3/4"" x 1"
Traditional rubber stamp. Up to 5 lines of text. Impression area: 3/4"" x 1-1/2"
Traditional rubber stamp. Up to 5 lines of text. Impression area: 3/4"" x 2"
Traditional rubber stamp. Up to 5 lines of text. Impression area: 3/4"" x 4"
Traditional rubber stamp. Up to 6 lines of text. Impression area: 1" x 1"
Traditional rubber stamp. Up to 6 lines of text. Impression area: 1" x 1-1/2"
Traditional rubber stamp. Up to 6 lines of text. Impression area: 1" x 2"
Traditional rubber stamp. Up to 6 lines of text. Impression area: 1" x 2.5"
Traditional rubber stamp. Up to 6 lines of text. Impression area: 1" x 3.5"
Traditional rubber stamp. Up to 6 lines of text. Impression area: 1" x 4"
Traditional rubber stamp. Up to 7 lines of text. Impression area: 1-1/4" x 1"
Traditional rubber stamp. Up to 7 lines of text. Impression area: 1-1/4" x 1-1/2"
Traditional rubber stamp. Up to 7 lines of text. Impression area: 1-1/4" x 2"
Traditional rubber stamp. Up to 7 lines of text. Impression area: 1-1/4" x 2.5"
Traditional rubber stamp. Up to 7 lines of text. Impression area: 1-1/4" x 3.5"
Traditional rubber stamp. Up to 7 lines of text. Impression area: 1-1/4" x 4"
Traditional rubber stamp. Up to 8 lines of text. Impression area: 1-1/2" x 1-1/2"
Traditional rubber stamp. Up to 8 lines of text. Impression area: 1-1/2" x 2"
Traditional rubber stamp. Up to 8 lines of text. Impression area: 1-1/2" x 2-1/2"
Traditional rubber stamp. Up to 8 lines of text. Impression area: 1-1/2" x 3-1/4"
Traditional rubber stamp. Up to 8 lines of text. Impression area: 1-1/2" x 4"
Traditional rubber stamp. Up to 10 lines of text. Impression area: 2" x 2"
Traditional rubber stamp. Up to 10 lines of text. Impression area: 2" x 3"
Traditional rubber stamp. Up to 10 lines of text. Impression area: 2" x 4"
Traditional rubber stamp. Up to 15 lines of text. Impression area: 2-1/2" x 2-1/2"